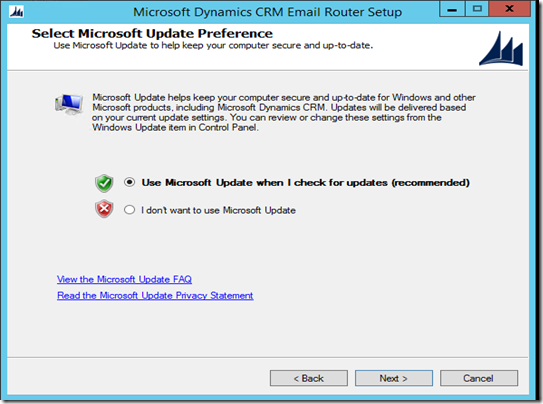 This post will let you resolve the issue of CPU usage which increases to 99% after installing Microsoft Dynamics CRM Email Router. 2. 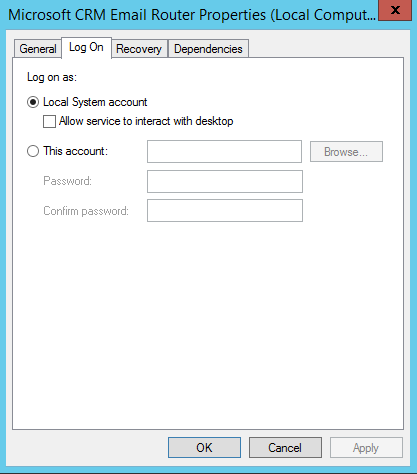 You will notice that router service is running under Local System account. Change this to other account. Click on apply and close the pop up by clicking OK.
3. Now open the task manager and you will notice that CPU starts getting down. 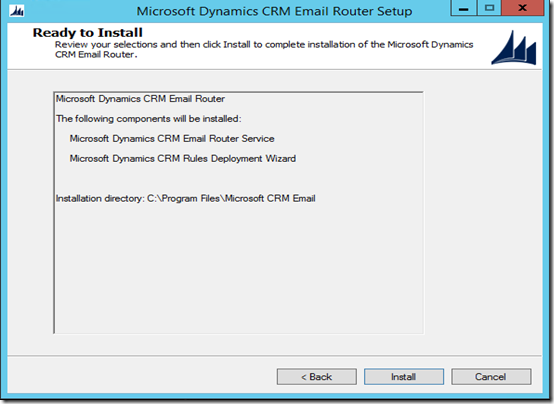 This post will cover how we can install and configure the Dynamics CRM Email Router using POP3 and SMTP server (For Example using Gmail). 2. On the License Agreement page, review the information and if you accept the license agreement, click I accept this license agreement, and then click I Accept. 4. On the Select Router Components page, select either or both options, and then click Next. 5. On the Select Microsoft Update Preference page, select how you would like Install the updates. 6. On the Select Install Location page, either accept the Default file installation directory or Browse to indicate a different location, and then click Next. 7. The System Checks page appears. 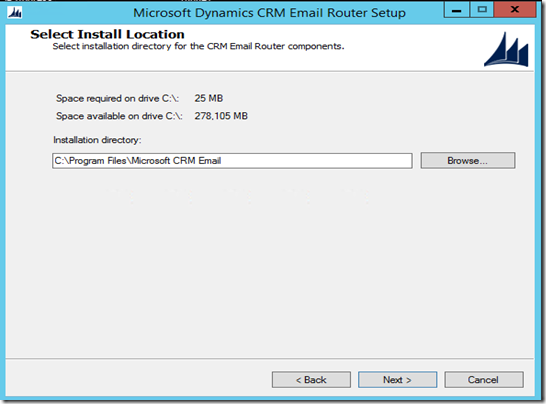 This page is a summary of all system requirements for a successful Email Router installation. Verification errors must be corrected before the installation can continue. 8. The Ready to Install page appears. Review the installation selections that you have made. Click Back to change your selections, or Install to install now. 9. 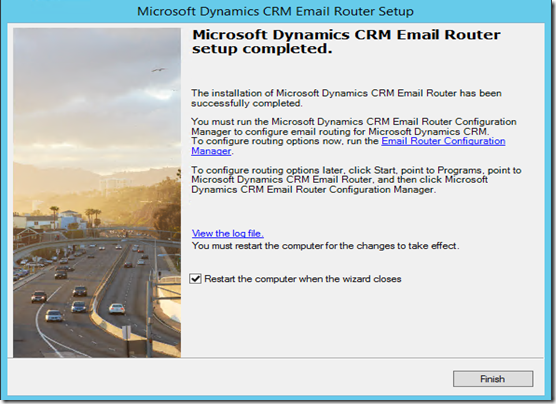 After Email Router Setup is finished installing files, click Finish. 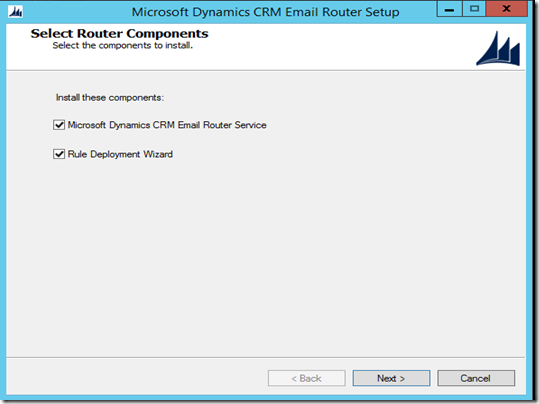 Now after installing the Dynamics CRM Email Router we will go through the configuration steps of it using POP3 and SMTP server type here i will show that using Gmail server. 1. 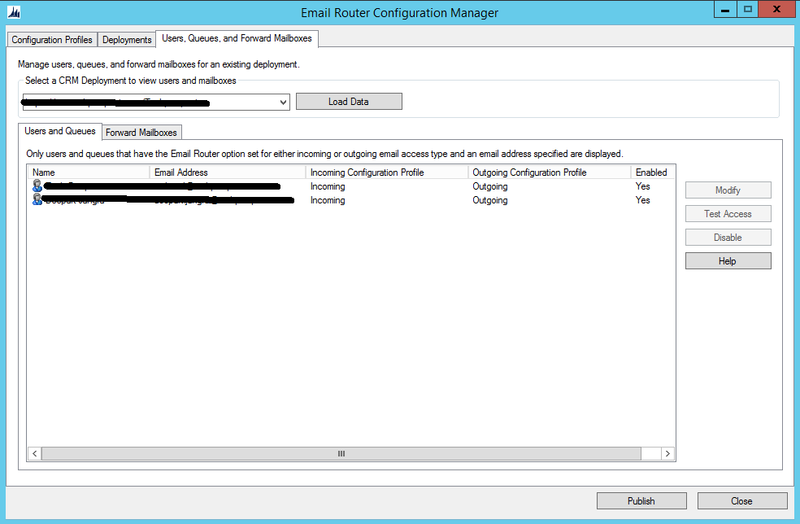 Open the Email Router Configuration Manager. c. Authentication Type to Clear Text. d. Check the Use SSL box. e. Email Server value to pop.gmail.com which is the name of the Gmail POP server. 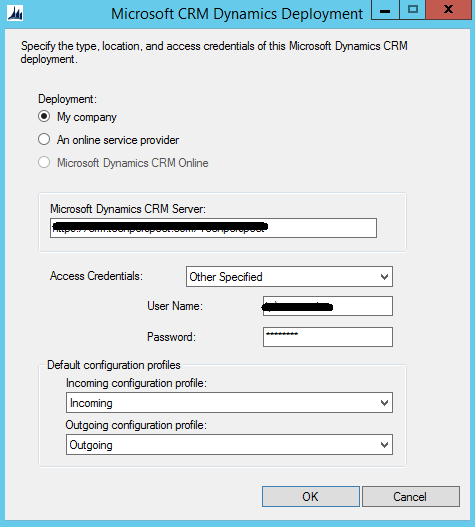 f. Access Credentials as User Specified (that will be pick up from the Dynamics CRM User Profile will show that in later steps). g. Now go to advanced tab and update the Network Port number to 995.
f. Email server value to smtp.gmail.com. g. Access credentials will be freeze to other specified. As like Incoming Direction there is no option for user specified. 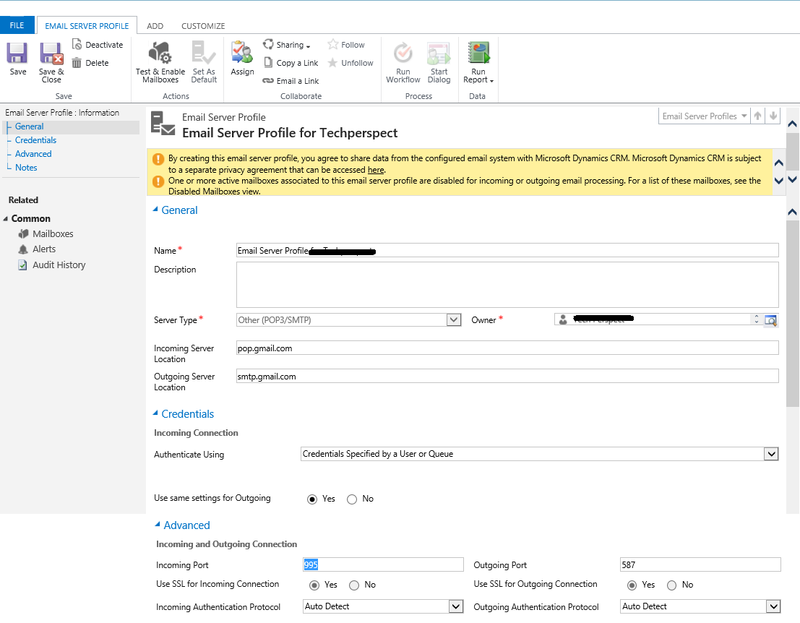 So you need to specify the credential of Gmail account which will be use for sending the emails from the Dynamics CRM and on the behalf of other CRM users. h. Now go to advanced tab and update the Network Port number to 587. 4. 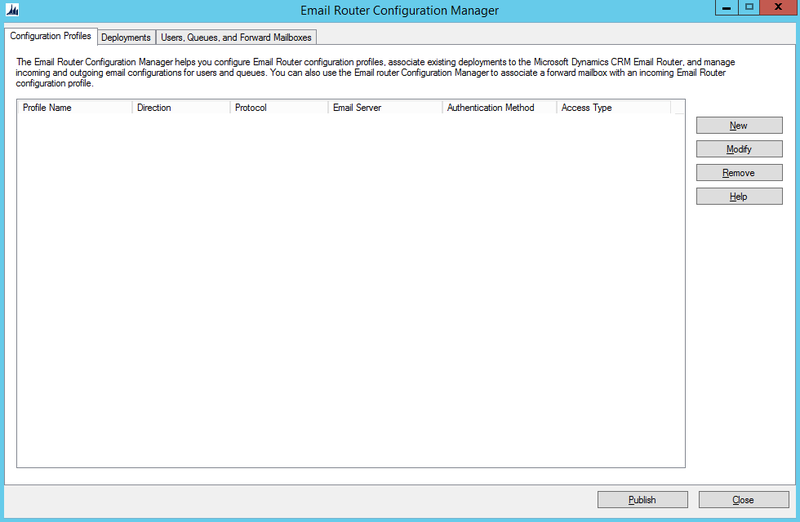 Now go to deployment tab of the Email Router Configuration and create new deployment. a. Select Deployment to My Company (Because i am having on premise (IFD) you can choose option according to your instance). 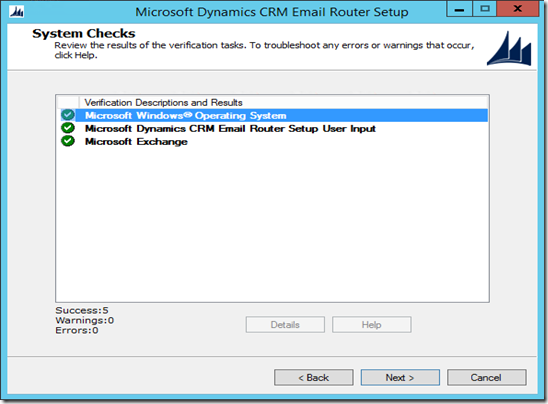 c. Access Credentials to Other specified and enter the credentials of your CRM (recommend to use Dynamics CRM admin credentials as that user will have full access to CRM). d. Set incoming and outgoing configuration profile to profiles which we created earlier. e. Press OK and close the popup. 5. 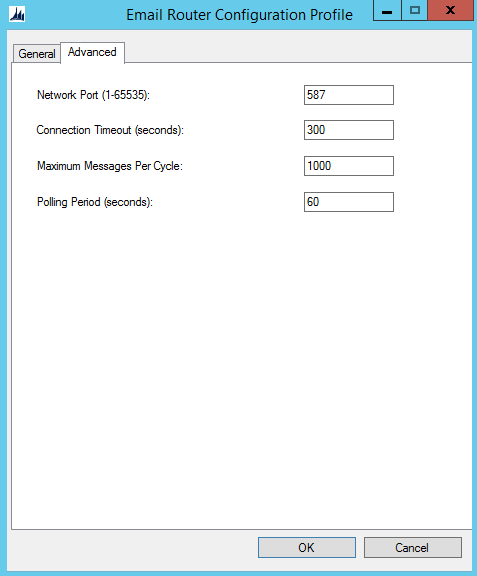 In next step go to Users, Queues and Forward Mail boxes tab and select the deployment that we created in previous step then click on load data. 6. 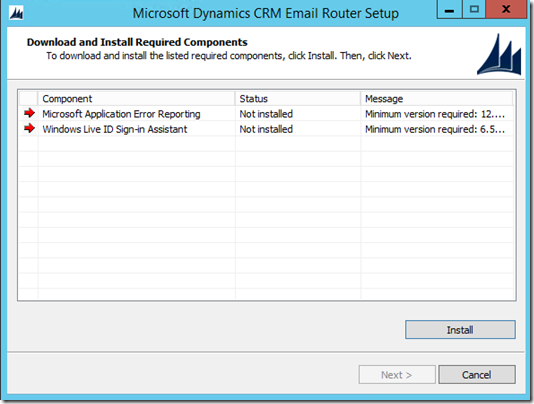 Now you will get the list of all the Users, Queues from the Dynamics CRM. 7. 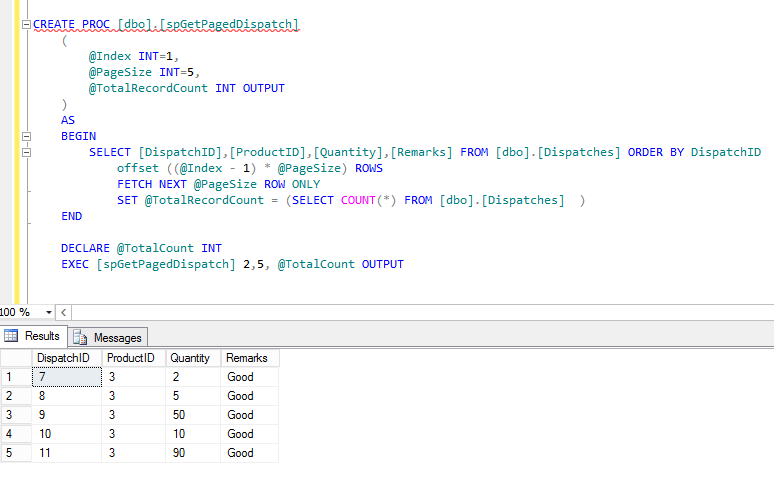 Now click on publish (That will save your all configurations done till now). 8. 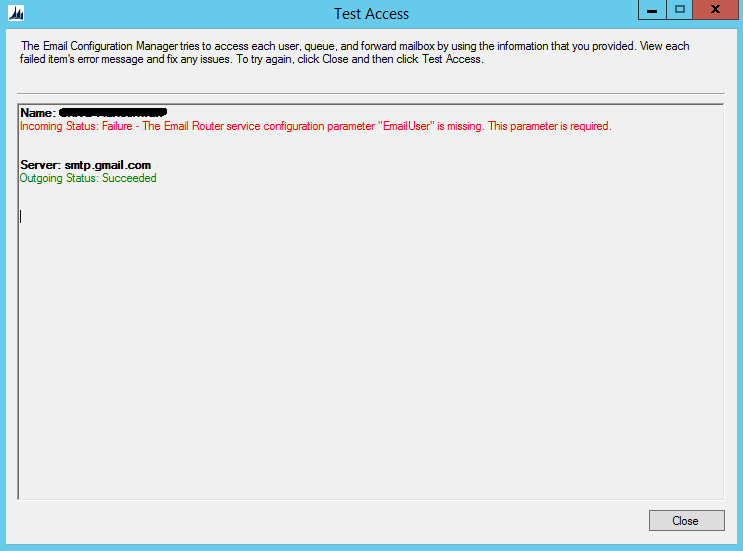 Select any of the User from the list and click on Test Access then you will get the error "Incoming Status: Failure - The Email Router service configuration parameter "EmailUser" is missing. This parameter is required". 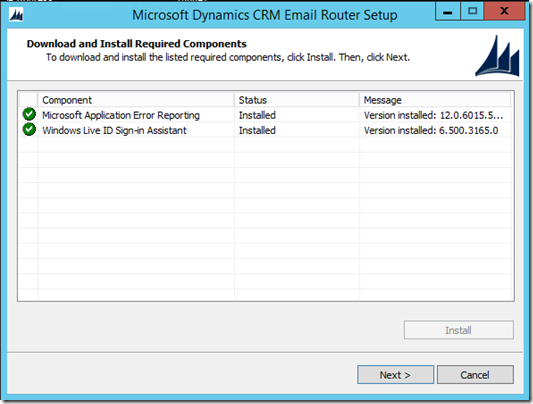 So to resolve this user or administrator need to specify credentials in Dynamics CRM mail box which is explained in next step. 9. 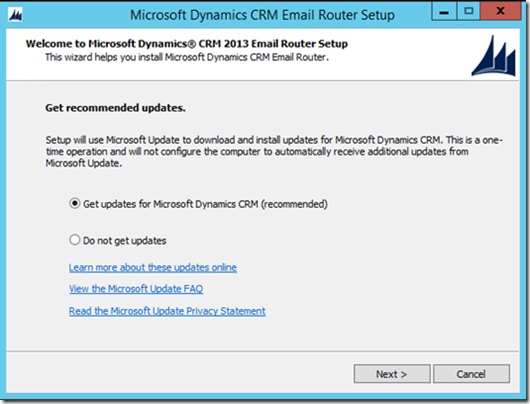 Log in to Dynamics CRM. Go to the Logged in User Profile and then Open the Mailbox. 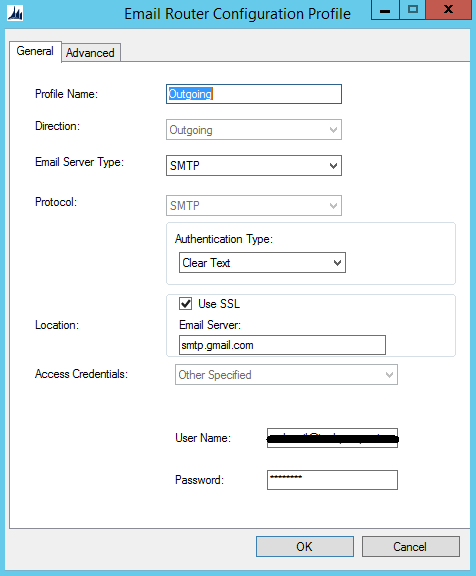 Enable Allow to use Credentials for Email Processing and enter the credentials i.e.Username (email address of the User) and Password. 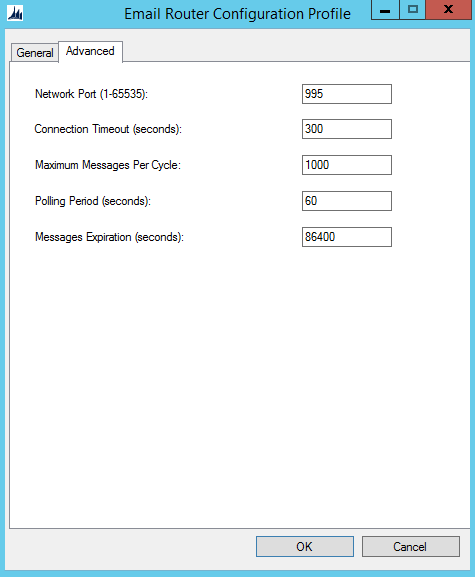 Ensure the Incoming, Outgoing Email profile and Appointments, Contacts, and Tasks set to Server Side Synchronization or Email Router. 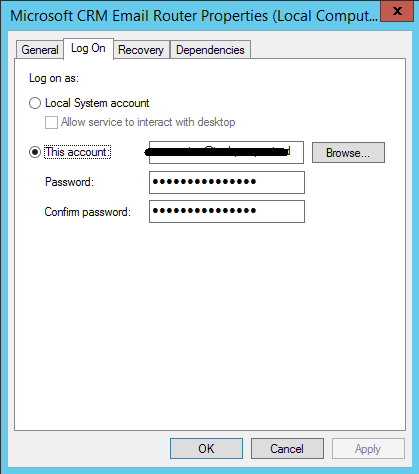 Server Type set to Other POP3/SMTP. Incoming and Outgoing server location are set to pop.gmail.com and smtp.gmail.com respectively. Enable the option Use same setting for Outgoing. Also ensure Incoming port set to 995 and outgoing port set to 587. And set the created Server Profile in Mailbox. Now you can test the configuration by click on Test & Enable Mailbox from the ribbon. 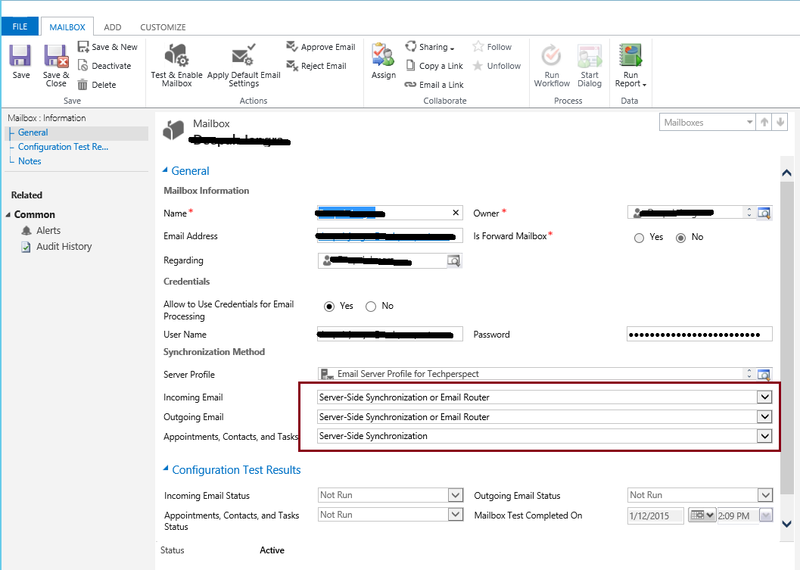 That's it now you can see in the Configuration Test Results section that all status are update to success and the user will receive a test mail from Dynamics CRM. 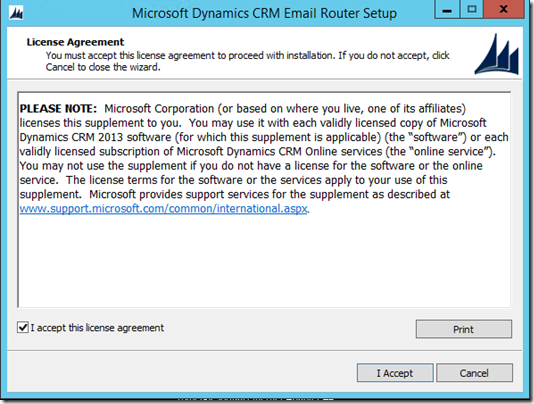 *Note Email address of the CRM Users need to be approved by the administrator. 10. Also now if you go to Email Router again and test the access for the user from the user list/queue that will show both incoming and outgoing status as succeeded. 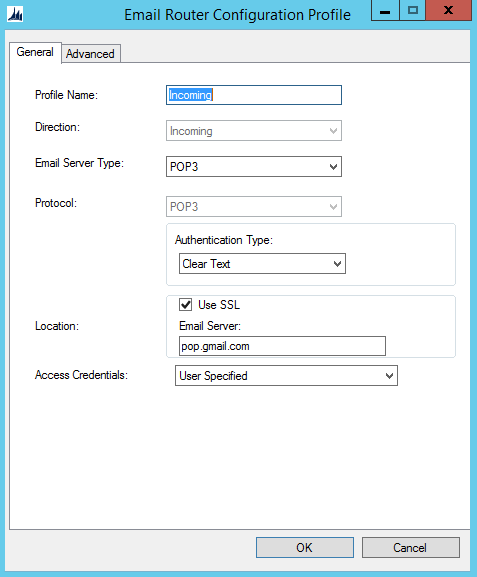 * If still facing any issues for Incoming Status then you need to verify that POP is enabled for the User email.